This patient has pulled through. 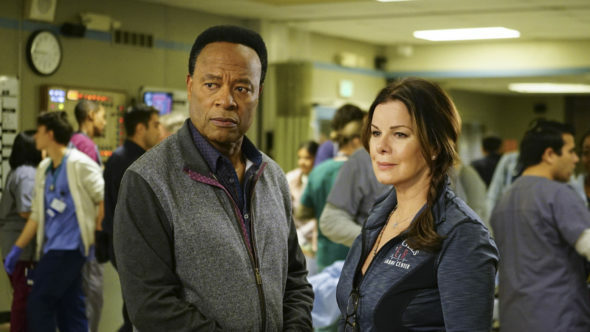 Today, CBS renewed the Code Black TV show for a third season. The medical drama takes place in a Los Angeles ER plagued by a staggering influx of patients that often outweighs the limited resources available to the devoted doctors and nurses who work there. The cast includes Marcia Gay Harden, Rob Lowe, Benjamin Hollingsworth, Harry Ford, Luis Guzman, Melanie Chandra, William Allen Young, Boris Kodjoe, and Jillian Murray. Over the past two years, Code Black has dipped significantly in the ratings. Season one averaged a 1.27 rating in the 18-49 demo and 7.11 million viewers. The show could have been cancelled but was renewed with some creative tweaks and cast changes. Season two continued to struggle and only brought in an average of 0.97 in the 18-49 demo and 5.98 million viewers. That’s a near 25% drop in the ratings. Those voters have now gotten their wish. According to Deadline, ABC Studios and CBS TV Studios co-produce the program and CBS was able to work out a reduced licensing deal for season three. Word is that CBS execs liked the writers’ pitch for season three. What do you think? Are you a fan of Code Black on CBS? Are you glad that it’s escaped being cancelled once again? Will you watch season three? 1/11/18 update: Season three of Code Black will debut on May 2, 2018. Details here. As someone who worked in ER in Los Angeles, I’m a big fan of the show and will definitely be watching. I’m a Code Black junkie!!! PLEASE keep this show on the air! One of the best TV shows out there, with real stories that show what goes in an actual ER. I haven’t enjoyed a show this much in years!!! Love Code Black. Better than some of the medical or emergency show on TV today. DO NOT CANCEL! My wife & I love this show! My wife & I love this show!! Love code black!!!! Keep it going!